Vietnam has begun preparatory steps to compile its economic plan for 2017, with a GDP target of 6.8 per cent set. The figure is slightly higher than the 2016 target of 6.7 per cent and within a directive signed by Prime Minister Nguyen Xuan Phuc and released by the Office of the Government on June 2. Vietnam will focus its reforms efforts on three major pillars to achieve the target. “Continue reform in public investment, the banking and finance sector, and enterprises, especially State-owned enterprises (SOEs),” is one of the points in the directive. Restructuring in the agriculture sector towards applying high technology and reorganizing scale and quality of agriculture projects will be sped up, focusing on support industries, processing, machinery and supply chains to develop agriculture and fisheries. Major focus will also be placed on high value-added industries such as tourism, telecommunications, and banking and finance, according to the directive. Analysts, however, doubt whether Vietnam can even achieve its 2016 target of 6.7 per cent given that figures indicate the economy is faltering. GDP, according to the General Statistic Office (GSO), reached just 5.46 per cent in the first quarter compared to 6.12 per cent in 2015 – a result HSBC economists view as “disappointing”. The government, however, confirmed on May 31 that it will not change the GDP target of 6.7 per cent. 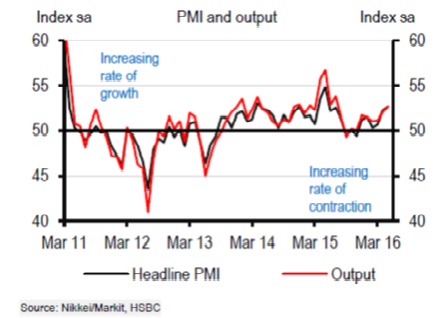 “We think this is going to be difficult to achieve, given the weakness of the first quarter 2016’s growth number and larger-than-expected headwinds to exports,” Ms. Izumi Devalier wrote in HSBC’s latest report on Vietnam’s economy, released on June 3. Likewise, economists at the Vietnam Institute for Economic and Policy Research (VEPR) said the targeted GDP for 2016 faced difficulties. In VEPR’s two scenarios for growth this year, the highest projection is just 6.5 per cent and the lowest around 6 per cent. “The concern we have is that greater pump-priming will lead to a build-up of risks when Vietnam’s macro buffers are still running relatively thin,” she wrote. 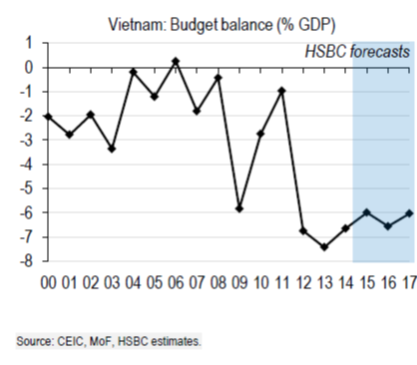 HSBC forecasts Vietnam’s budget deficit to widen again this year, to 6.6 per cent of GDP, causing the public debt-to-GDP ratio to approach the National Assembly’s limit of 65 per cent. Regaining fiscal wiggle room requires efforts to broaden the revenue base and reduce current expenditure, but these reforms will take time, according to HSBC. “In the interim, we think slower but ultimately more sustainable growth may be preferable,” the bank said. Though HSBC analysts believe that Vietnam’s economy could spur a little bit in the second quarter of 2016, with GDP perhaps being 6.1 per cent, its previous forecast of 6.3 per cent remains unchanged.